Totes or otherwise known as IBC Totes are commonly used for many things such as transportation of chemicals and materials in plants and across state lines, but they are also used for various repurposed things. 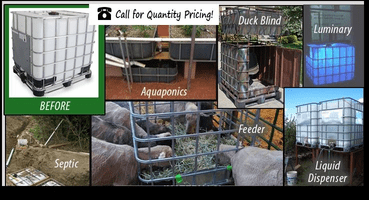 Some of the things we have seen others use the Totes for are Duck Blinds, Deer Feeders, Aquaponics, Septic Systems, Cage Feeders, Dry Good Storage, Swimming Holes, Home Made Jacuzzi, Pressure Washing, Holding Liquids for Dispensing or Drinking Water as well as Illumination and Lighting. With the Food Grade Totes you can use them for Human Consumption and Bathing in remote areas. Most have the steel outer cage wrapped around the plastic HDPE hard bladder. The bottoms can be made of Steel, Wood, or Composite Plastic as well. There are typically two popular sizes 275 Gallon and 330 Gallon, although there are many other sizes as well.